Allan Howeth has represented clients in estate planning, probate, estate, gift and income tax practice since joining Cantey Hanger in 1963. Mr. Howeth served as Managing Partner of the firm for twenty years, first serving as an interim Managing Partner, then as the elected Managing Partner from 1985 to 2004. 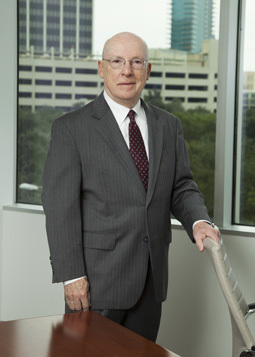 Mr. Howeth is the former managing partner of the firm and is a former section head of the Taxation, Trust and Estates, Small Business Organizations Group in the Fort Worth office. A native of Fort Worth, Mr. Howeth joined Cantey Hanger in 1963, after receiving his law degree from Southern Methodist University that year. As an undergraduate, he first attended Texas Tech University, and then transferred to Texas Christian University, earning his B.A. in 1960. His legal expertise includes individual and business tax planning, purchase and sale of business organizations, estate planning, probate and trust related matters. How to Avoid Probate: An Answer from Texas, Texas Bar Journal (1966). Chapter Author, How to Live and Die with Texas Probate, Real Estate, Probate & Trust Law Section, State Bar of Texas. Numerous Continuing Legal Education presentations with State Bar of Texas. Southwestern Legal Foundation, and American Bar Association.